On Wednesday of last week the Software Testing Clinic held yet another excellent event in London; this time at the Thoughtworks offices in the West End (I love your London office space Thoughtworks!) and the topic this month was Exploratory Testing. At that point I was (correctly!) questioned on that assertion by my friend Tony Bruce on why I think one is positive and one negative. There was evidence of bias against black applicants. Bias towards younger people in recruitment. They made certain assumptions about the market. We’re working on the assumption that the time of death was after midnight. The same as I thought; one is “considered to be unfair” which lends to the negative connotation in my mind. The other is neither negative, nor positive; it is just something that has not been proven one way or the other. I assume that the logo at the top of this page will have a hyperlink back to the homepage. I assume that the navigation items all have hyperlinks to their correct pages. I assume that if I do not enter the mandatory fields on this form that some validation will take place and I will be presented with a suitable error explaining that the form could not be submitted in its current state and that I need to make some specific corrections in order for the form data to be submitted correctly. All of those assumptions are things I actively think about and set out to prove or disprove during my testing. They are active, mainly positive thoughts used during testing. 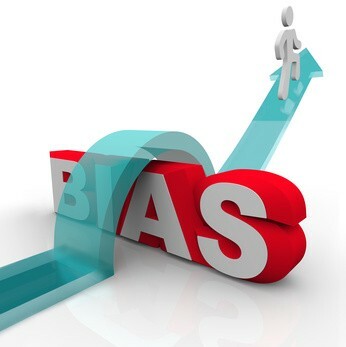 A bias on the other hand is something passive and that I’m often unaware of until I break my normal processes, sit down and ask myself whether there’s any bias being applied. I have a bias to navigating websites with my mouse; I use the mouse wheel to scroll, I move the mouse cursor to elements and click links rather than using keyboard navigation to scroll, tabbing through elements and select them with Space/Return. Unless I actively think about that (and in the process turn that bias into an assumption that tabbing through links and selecting them will be as effective as clicking) I could miss the fact that the tab order is completely erratic because of that bias. When testing new websites for clients I have a bias toward believing what the browser Status Bar tells me a link is. I know there’s a possibility the link displayed in the Status Bar won’t necessarily be the *actual* link but as I see no reason for a project owner to deceive me I trust that the link shown is the link that will be opened. It may be that the client has decided to make links look ‘neat’ by adding a hover status to them and I wouldn’t initially know because of that bias. I have a bias toward using my Windows machine for my test tools. Unless there’s a specific tool I need that is better on Linux or Mac I use what I’ve used for years. There are likely lots of excellent tools on other environments that I don’t know of because those environments aren’t used enough by me. My efficiency is undoubtedly compromised occasionally because of that bias. So there you have it; my (possibly over-thinking it!) definition of how I see Assumptions vs Biases in exploratory testing. Knowledgeable and skilled Technical Tester with 15 years' experience testing software, websites and apps using agile, Agile (not the same thing) and Waterfall.